If you read my last post, you know....I'm a floss-hoarder! I vowed to make one last run to the craft store to purchase the last bits of floss I need to complete the kitting up of 5 HAED charts. Why not give some away!? This will be a VERY SHORT giveaway, since I'm going shopping tomorrow! I'll draw the winning names at 10:00 am EST on 04/14/2012 and will announce the winners shortly thereafter. To Enter.....Just post a comment! If you don't list any choices, I'll pick some out for you! *all color choices need to be the regular cotton floss...I wish I could afford buying 20 skeins of the specialty stuff! This is open to anyone anywhere, as long as you can receive mail! Love your blog. Would love a chance to win some floss. Any colors will do, I am always in need of more to kit up some patterns I have. Thank you for the chance. colours. Thank you for the chance. Wow Leslie. What an awesome giveaway. I would love to entered. Any colors would be fine except no white, 310, 321 or 666. I have tons of those colors. Thanks for the chance. Wow Lesli what an offer. My email is dragonsluver@frontier.com. I would love a random selection. Good luck everyone! WOW this is a great give away, and I had to comment as how can you let this opportunity pass you by. This is certainly a wonderful thing for Friday the 13th. What a generous giveaway! I happen to be collecting my fibers for a large design and here is my list DMC 300, 304, 307, 310, 317, 340, 349, 413, 436, 640, 648, 676, 677, 712, 729, 781, 783, 813, 826, 828.
what a wonderful present this is for the lucky one! I would love to participate and the only preference I have to colors is the newer one (O to 200 or from 3830 and up). My address is la.dulcinella@gmail.com. What a fab giveaway! Here in the UK we regularly pay 90p a skein in a shop or 65p online. Incredible I know. I need 3705,3721,3731,3733,3760,3804,3805,3808,3824,3831,3832,3833,3837,3842-46,3851 and 3857 to nearly complete one set of all the colours. But frankly, anything would be gratefully received LOL. My email is in my profile but for ease it's joanneperry179@gmail.com. Please enter me. You've got my email address, but it's CNewton724@gmail.com. How fun is this! Our choice! 797,798,820...good luck to all with this generous giveaway. DMC floss colours of your choice. What a great idea! Please throw my name in. Surprise me with the colors. My favorite color is pink. What a lovely giveaway, please count me in. I would let you choose the colours, make your shopping trip a little more exciting. Have fun today. A very generous giveaway. Not sure with the time difference if I have made the deadline. 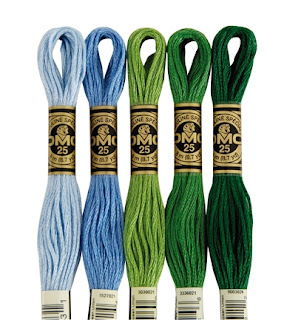 DMC threads cost about $1.55 where I live so you are extremely lucky to be able to get them at that price. I may have missed the boat,but if I haven't I'd love to be in your brilliant giveaway and I would like you to choose for me.Thanks Lesli. I hope I still have the chance to win the fabulous giveaway!